How to be a freelance accountant in Malaysia? - The typical Malaysian careers would be medical doctors, pharmacists, lawyers and most of the times, accountants. Sometimes you will hear aunties and uncles saying: “Boy ah, next time when you grow up be an accountant la. Can earn big bucks!” Ever wondered what does it take to be a qualified accountant? This article is just for you! From small independent businesses to large corporate bodies and even governmental organisations, accountants work to have different job scopes such as auditing, taxation, assurance, corporate finance, management consultancy and forensic accountancy. 11. managing colleagues, workloads and deadlines. One could say that accountancy’s future prospects are desirable and it is the job that rarely has employment issues even in economic downturns as literally every business from large to small will require the professional services of an accountant. 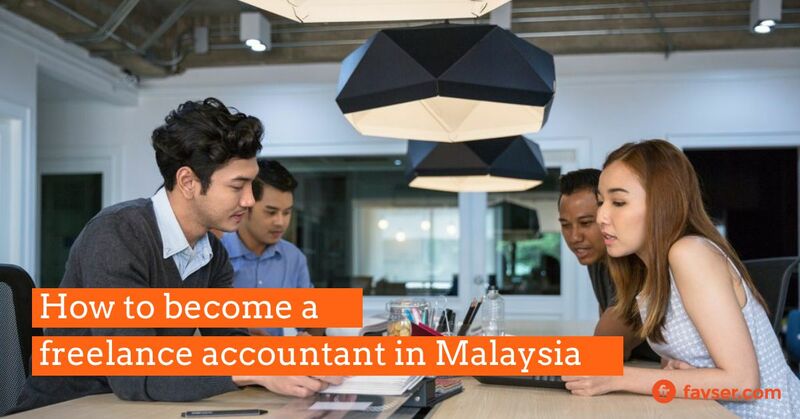 In Malaysia, how can one be a professional accountant? There are a few pathways that ensure your employability as a professional accountant. There are many universities, be it local or private, offering a bachelor’s degree in accounting. Just like any other university courses, one will be exposed to a range of subjects covering various fields of job scopes as an accountant. Moving on, one will also be required to sit for certain exams from the Association of Chartered Certified Accountants (ACCA) or the Chartered Institute of Management Accountants (CIMA). With the completion of a bachelor’s degree in accounting plus passing the relevant exams, you are good to go! If one is opting for a faster alternative than struggling through a 4-year degree, ACCA is your solution. Upon completing SPM from secondary school, one can go through the ACCA Foundation Programme which only takes a year to complete and the programme will focus on the fundamentals of accounting. One can then proceed with the 2-year full-time ACCA course with all the professional papers and exams. Overall, with a successful completion of the ACCA course, one can step into the workforce much earlier than those doing a bachelor’s degree. With the relevant qualifications in your pocket, here are 10 very important skills that every accountant needs. These skills are tailored for those just off the boat to those who understand every know-how in the industry. An accountant deals with numbers. An accountant deals with papers and files. An accountant can work for a single company or just freelance his way with a few bosses. If that large amount of data, it would be like finding a needle in a haystack if an accountant lacks organisation. Excellent organisation of files, data and information is the key to smooth sailing work. Accountants should master the techniques of document filing and sort spreadsheets in folders for separate events. Being able to find the documents needed helps to save time and put your mind at ease while working. Time is gold. Every second tick away into oblivion and work still has to be done! Rushing with deadlines to meet and reports to hand in requires the ultimate skill of time management. Managing your time wisely enables you to be in control of your work. At the same time, work can be done efficiently when the time is planned. Breaks can be added into the schedules to help you take a breather, do some stretches and have a cup of coffee before going back into the ‘war zone’. There are many different applications that can be installed on multiple devices to help plan one’s day ahead. With great planning, you can get more customers and jobs, earning more than what you need. Just like how doctors need to diagnose the right disease; pharmacist giving the right dose of medication for treatments; accounting work is just as tedious. Accounting is all about numbers. Typing errors and misplaced decimal points are easily overlooked and can cause a huge cascade of consequences. RM188 million and RM1.88 million is such a vast difference when a small dot is placed. Accountants need to have an eagle’s eye to be able to tell the differences and to note the errors to ensure all data is accurately presented to the clients. Your attention to details can bring a large impact to your client’s company. It was always noted that accountants will be isolated people from the world, typing on the calculator, filling in spreadsheets with papers filling their desks. In fact, accountants of this generation require what every other job needs – communication skills. It is pivotal to understand the expectations of your clients to ensure that as accountants, you will advise and provide the best information and financial solutions to them. In addition, if you are freelancing, customer service skills are needed to make sure your clients are satisfied with your work. These skills combined to help accountants build strong and most of the time, lasting relationships with clients. “Integrity is doing the right thing, even when no one is watching.” - C.S. Lewis. Dealing with finance and the accounts of your clients’ companies is a huge responsibility because your clients trust you fully as their accountant to undertake the tasks regarding their money. Money has always been a sensitive topic and people are naturally wary of others handling their assets. Hence, it is impeccable that accountants have integrity in their work. Be it a small or large company dealing with ten thousands or billions, having integrity and honest hands will reward you with something more valuable than money – the trust of your clients and the perception of your personal character. An honest person will always be regarded highly by others. Besides being able to keep your stable job, you may find yourself having customers knocking on your door for your professional services! A freelance accountant can take up as many jobs as possible within their limits. Showing your full commitment and interest in the jobs makes you a crème de la crème accountant. Employers and clients would be very delighted to be able to work with committed accountants on a long-term basis. Heidi Reeder says that commitment is the foundation of great accomplishments. Indeed, placing your full commitment ensures secured jobs from clients and even boosts your reputation as a reliable accountant in the industry! Pssst. Maybe offers will come knocking on your door! Accountants deal with money and finances, but nobody said that financial analysis is an easy topic to cover. When economies fluctuate, what can an accountant do to help your clients navigate through murky waters? What can an accountant do to give a lift to businesses and incomes? All of these require the creativity and critical thinking of an accountant. Though skills as such come with years of experience, however, it is always a lifelong learning process to constantly upgrade oneself to be the best at your job. Critical thinking enables an accountant to be able to make the best decisions for their clients. Numbers, numbers and numbers! We discussed about the need to have an eye for details even to the smallest decimal. An accountant will also need data analysis skills when it comes to accounts and finance. It’s not just about balancing check books and reporting numbers to your bosses. Accountants need to identify trends in the market to make businesses profitable. A good accountant will know how to pay attention to note the factors contributing to the numbers in the accounts. Hence it is definitely more than just the technical aspect of accountant as analytical skills play a very important role too. Being a human, it is easy to spill the good news rather than the bad. The same goes for accountants. It is always an easy task to tell your clients that they are making a profit; it is harder to spill the beans when things are taking for the worse. This is where decisiveness comes in. There will be tonnes of financial choices to choose from. A successful accountant would need to make crucial decisions that will benefit clients most. Weighing out the best option and coming to a decision will make your clients feel confident with what you do and they will be more than happy to accept your opinions. Last but not least, an accountant needs to know some basic software skills. In this era where it is all about paperless and convenience, a smart accountant will need to know some basic software to ease and simplify workloads. One should be familiar with Microsoft Excel and QuickBooks and it would be best if one could memorise common formulas and shortcut keys. Create your own customised spreadsheets to work effortlessly. Be up to date with how different banks manage their online banking services and how to obtain relevant information. These tips will help you to work smarter. Having these 10 essential skills will ensure that you are one step ahead in this competitive industry. Start applying and practising! A third of the Malaysian workforce is in the freelance business. If you are an accountant looking to get some freedom in what you do, try freelancing! Whoever said that accountants cannot freelance? Favser is Malaysia’s leading freelance platform offering people a chance to work by obtaining freelance projects. If you are looking for an internship, part-time or even full-time positions, Favser is your one of a kind portal to opportunities like these. It will only take 10 minutes of your time to create a profile and you can start hunting jobs. The best part – IT IS FREE! Join us now!